music and video. As an artist, Antaramian-Hofman has created drawings and paintings in response to what she has learned and experienced of this little known history. The award-winning artist and writer immigrated to the United States from Soviet Armenia at the age of five. From her early years in Wisconsin to her later years in California, she focused on disciplines in the arts and the sciences. At 19, she left Fresno for Los Angeles to study fashion design and illustration. She worked as an illustrator for several years in advertising for a Los Angeles-based fashion company as well as working as a freelance illustrator for fashion and costume designers. In the late 1980s, she followed a career path in the sciences and worked in the environmental field for over ten years. Before returning to Fresno from Los Angeles, she received an A.A. from the Fashion Institute of Design and Merchandise; a B.A. in Chemistry; and an M.Sc. in Environmental Science. After starting a family, she re-entered the art field and received an MA in Arts and Design with distinction and the outstanding thesis award from the College of Art and Humanities at Fresno State University. She focused on medieval art and presented at numerous national conferences, including the College Art Association in 2010. Antaramian-Hofman also began painting again; she participated in group exhibitions and held several local solo exhibitions. In 2013, the award-winning artist and writer, received an artist grant from the Puffin Foundation to support the inaugural exhibition of her latest body of work called "Repatriation and Deception," which responds to questions of political propaganda, homeland, and personal desires of fulfillment and hope. As she continues to work on the post-WWII repatriation to Soviet Armenia in preparation for her final set of exhibitions in 2014-15, she begins a new series of paintings that offers her reflection on enigmatic women in world history, including the female character, both fictional and nonfictional, in Armenian history. For further information see artist's CV. I was born in Soviet Armenia, but I was given a name that was not at all Armenian. The desire to leave the smallest of the Soviet republics and head to the United States at the height of the Cold War by my French-Armenian mother and my American-born Armenian father was so strong that they gave me an "Anglo-Saxon" name in hopes that it would actually happen. My parents, Paul and Vergini, had often heard the name "Hazel" in stories that were told by my maternal grandmother of her time in the United States, Ohio and then New York. It was the name of a Scottish woman who had befriended and aided my grandmother, Dirouhee Samuelian, during her younger years at a time when NYC was teeming with immigrants from Europe and beyond. Only my paternal grandmother, Siranoush, rejected this name. She was a genocide survivor, who was raised in an orphanage in Syria. A staunch believer in keeping the Armenian heritage, she called me "Takouhi" throughout her life. It was the name of a deceased great-aunt on my father's side of the family. The duality that existed in my household went beyond onomastics. Language was even a greater issue. My family spoke Western Armenian, but living in Soviet Armenia, it was met with some disdain and ridicule since Eastern Armenian was the more common dialect and Western Armenians were considered "akhbars," a term used pejoratively. Dirouhee had lived in aristocracy in Izmid, near Constantinople* before leaving for the United States to escape the beginnings of greater atrocities in the Ottoman Empire, while Siranoush was an Armenian orphan of the genocide to be later adopted by an American-Armenian couple from Chicago who had recently lost their biological child. Late-nineteenth century and early-twentieth century forced migration and the decisionmaking mechanics of survival by Armenians living in Ottoman Turkey historically marked the displacement of land, culture, and identity. When the orchestrated "Great" repatriation began in 1946, scores of Armenians living in the diaspora responded to an appeal made by Soviet officials and Armenian organizations to "go back" to Armenia. It was the beginning of more cultural and economic disconnects as well as a set-back to those who had longed for their ancestral homeland. As for their children, however, it was never really their home since they had been born in the Diaspora. (Read more at: http://www.balcanicaucaso.org/eng/Regions-and-countries/Armenia/From-James-Dean-to-Stalin-the-tragedy-of-the-Armenian-repatriation-121168). After the death of Josef Stalin in 1953, the socio-political tensions in Soviet Armenia began to thaw. Many political prisoners were released. The visit of French Prime Minister Christian Pineau in 1956, was a pivotal event that helped expose the plight of the French-Armenians to the Western world. The event had a ripple down effect for the other repatriates. The handful of repatriates that were allowed to leave in the late 1950s and early 1960s were mainly the French-Armenians and the American-Armenians. However, there had to be an immediate family relative to initiate the emigration process. My family was successful in getting its exit visa to leave in 1965, despite many issues with the embassies, the issuing of passports and troubling air travel scenarios. Our ability to leave was in thanks to my paternal grandmother's convoluted adoption history that had officially 'given' her a sister in the United States. Eventually, my entire immediate family left Soviet Armenia, leaving behind my deceased maternal grandfather, Sebouh Hekimian, who died months before my birth. Born in Abkhazia, he was a man who was originally from Ordu, a port city along the Black Sea, notably a different cultural world of Armenians. As a young orphaned man, he grew up in France where he had worked, married and had children. He now lays to rest in Yerevan as a French-Armenian repatriate from 1947. There were many others like him. Arriving in the United States at the age of 5, I spoke Western Armenian and no English. I began schooling within months after our arrival to the United States. Compelled to learn my new found language quickly, my father spoke only English with me, my sister, and my mother. To the chagrin of my paternal grandparents, my Armenian regressed and no longer developed beyond that of a child's vocabulary. 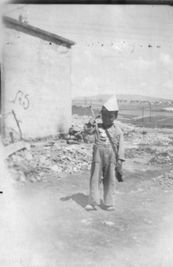 Living in an area of the United States where there were no Armenian schools, I lost the little that I knew of my native language. One day, I remember overhearing my paternal grandfather, Asadour Antaramian, say to my father that my sister and I were not his grandchildren unless we spoke Armenian. As a child it was difficult to comprehend this--no doubt it added to my questions of my Armenian identity. After 35 years, I began my search for cultural identity and native language. I returned to Armenia in 2006 for the first time since leaving at the end of 1965. Now a country no longer within the sphere of soviet communist ideology, I found Armenia beginning to experience the wonders and struggles of its independence. In 2011, once I completed my second master's degree, I went back to Armenia, this time as an artist and scholar, to engage in ethnographic research of documenting the history of the post-WWII Armenian repatriation. Outside of several memoirs written by repatriates, this is a personal story not much has been written about in the history of modern Armenia and one that I have wanted to tell for many years. My time to begin telling the story with images and text has finally arrived. *The city officially became recognized as Istanbul upon the formation of the First Turkish Republic. I am always interested in meeting repatriates and documenting their stories for my lecture presentation. I can be reached at hazelantaramhof@yahoo.com, please put "Repatriate Project" in the subject line. What defined an Armenian in the Diaspora prior to the Cold War? Why were groups of Armenians living in such geographic places as the United States, France, Greece, Lebanon, Iran, Iraq, Bulgaria, Ethiopia, Syria, Egypt, or China? For me, these new "homelands" were most notably to escape the political and social tramas experienced in the Ottoman Empire. When I began looking at the Ellis Island shipping manifests of immigrants at the turn of the twentieth century, the evidence to this effect, based on dates and places of birth, was quite clear. Many, who were capable of travel and could find refuge and opportunities to survive and prosper, did so. Many lied about their ages so they could enter other countries. These are the young Armenians who later grew up, married, and had children who were born in the Diaspora. Top: Grandmother, who was born in Izmid (Nicomedia) around 1906, with granddaughter born in Soviet Armenia. Top: Grandfather, who was born in Kharpert around 1895, with granddaughter born in Soviet Armenia. 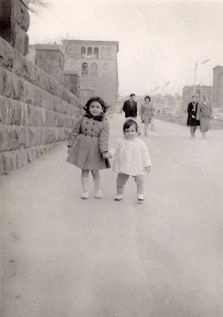 There were many "akhbar" children who had happy childhood memories of Armenia. Never truly recognizing the condition of their status or the history of their family. Many retained their languages in the home, among some speaking only French, English, or Western Armenian. They grew up amid the struggle in the accommodations of their living conditions, standing in bread lines for their mothers or using outhouses. Over time, particularly in school, they did recognize a difference between them and the "deghatsees," the Eastern Armenians. Ridicule and discrimination was not that uncommon in the early years when the Easterners felt their meager resources were to be impinged upon by those coming into their country. PHOTO ON LEFT: Daughters of repatriates Paul Antaramian (USA), and Vergini Hekimian (France), Hazel and Jacqueline, born in Soviet Armenia. Their shoes were made by an Egyptian-Armenian repatriate shoemaker. Many times the repatriates would help each other with essential items. I was told that my white shoes were made by an Egyptian-Armenian shoemaker repatriate friend, since such things were unafforable to us otherwise. During the early years, in much desperation, my grandmother used heavy blanket material to sew "shoes" for my uncle when he was a little boy. PHOTO ON RIGHT: French-born repatriate, Massis Hekimian, around the age of three, wearing shoes made of heavy blankets. The family endured severe poverty after moving to Armenia in 1947, living entirely from what they could sell from their personal belongings. His mother, Dirouhee Samuelian Hekimian, born in the Ottoman Empire and later educated in the United States, survived the best she could two school-age children and a husband who suffered from ill health. 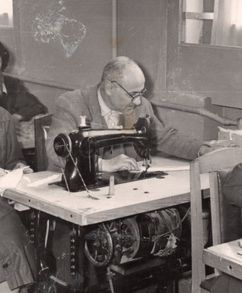 Top: Sebouh Hekimian, (repatriate from France, genocide survivor) working in one of the clothing factories in Soviet Armenia. In 1959, Sebouh became very ill and died in Armenia prior to his family's successful exit out of the country in 1965. After more than half a century, the "akhbars" are now acknowledged for having brought Western Armenian culture and cosmopolitanism to Soviet Armenia. Food, drinks, clothing, technologies, trades, and a new way of thinking was infused into a sovietized poor country. Armenian coffee was introduced to tea-drinking Eastern Armenians by those Diasporan Armenians from Lebanon, Egypt, and France. Certain work trades were practiced by the "akhbars," such as shoe-making and tailoring; equally, the importation of modern technologies were important in the economic development and industrialization of the country. Cultural and linguistic advances were also made in Armenia during the 1950s and 1960s; English was taught to the children of local Soviet Armenian officials and other non-Diasporans. Unfortunately, many of the repatriates had to learn how to live within the Communist system to survive. Survival meant selling personal belongings at the Sunday "black" market to have a few rubles for the petty amount of palatable food available in shops. Many had been accustomed to toilets and running water, whereas now they had outhouses and had to get their water with buckets. Many were assigned one room to a family or underground living space until promised Soviet apartment housing was prepared. Those who did not learn to live within the system or complained about the system, disappeared in the middle of the night with a "X" inscribed on their door. Those who tried to leave the country by contacting foreign embassies were tortured. Some elder repatriates were so distraught about their decision to "return" to Armenia that they committed suicide or died of despair only a few years after they had arrived. After 1953, the outlook for many repatriates, now grown, were much better. Yet, they were still living in a Communist country during the Cold War and movement was closely monitored or entirely restricted for those Armenians who were born abroad, particularly those who were from the United States.